Lucky us! This time of year, there is an abundance of fresh vegetables and fruit in the Missoula Valley. If you’re looking for a creative way to eat more fruit and vegetables, try making your own smoothies or veggie chips! Both of these foods are an easy-to-make and healthy snack, with lots of room for adding your favorite flavors and personal flair. 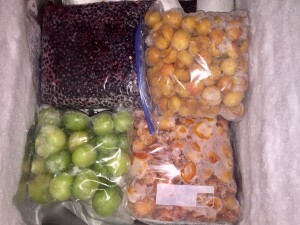 Local apricots, peaches and huckleberries are ripe and abundant! And, by incorporating greens from the garden, smoothies are a refreshing and healthy breakfast on-the-go or mid-morning snack. Smoothies also offer an excellent opportunity to clean out your freezer of fruit from last year to make room for more vegetables, fruit, and meat from this season. I use a very basic framework for my smoothie making, which makes it easy while providing plenty of room for variety and experimentation for whatever I have on hand. You may find that you personally prefer a little more or less of “this or that,” so feel free to amend the ingredients below as you see fit. This morning, I made a simple smoothie with apricots (frozen from last year’s harvest but you can also use fresh), milk, yogurt, kale, ginger and half a banana. If you’re looking for an extra punch of flavor, consider adding a dash of vanilla extract, a couple teaspoons of grated ginger, or a small handful of fresh parsley or basil. If you’re looking for more protein or richness of flavor than what the milk and yogurt provide, try adding protein powder, a farm fresh egg, or chia seeds. 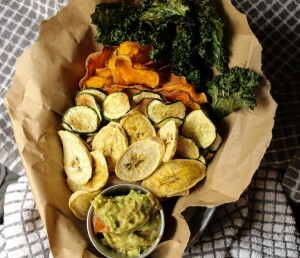 Another great way to go through a surplus of vegetables is making veggie chips! If you slice your vegetables into thin strips, just add a little seasoning, and then dehydrate them to make healthy (non-fried) veggie chips. My friend revealed to me that she uses ready-made “popcorn seasoning” to flavor her veggie chips. This means your favorite salt n’ vinegar, barbecue or white cheddar flavored chip can be homemade! Yum!! For more information on dehydrating vegetables or fruit in the oven, dehydrator or sun, check out this guide, a book from the library or another online resource.